Why a web-site with a calendar of ethnic festivals in Toronto? And why restrict it to free or almost free events? Why include Halloween and Canada Day and why did the police come knocking at my door? It began when I was assigned by VisualTravelTours.com to write and photograph self-guided tours about Toronto’s multicultural world and Toronto’s Chinatowns. I’m a travel writer and photographer whose passion has taken me several times around the world. Today, paying markets for such efforts have dried up. We professionals can’t afford to travel very much any more. The amateurs have taken over. Then I discovered I could experience the whole world – well elements of the whole world – in my home town. I can’t find a Taj Mahal or face charging rogue elephants here, but I have seen shamans from Bolivia and mask-changing performers from China. In the GTA, I’ve found exquisite Egyptian churches and exotic India and Thai temples. Within an hour’s drive, I have been thrilled by vicious bull running, like in the Azores. Even though I’ve lived in Toronto for over forty years and thought I knew everything about my own city, these two assignments opened my eyes to facets of Toronto I didn’t know existed. Although I’m a third-generation Chinese-Canadian who has written guide books on China and Hong Kong, I have even discovered unknown customs in my own community – among my own relatives. For the assignment, I visited a Sikh temple during Guru Nanak’s birthday celebrations and a United Church whose congregation was from Ghana. I photographed a Swedish Santa Lucia festival, its lovely maidens wearing crowns of lighted candles on their heads. 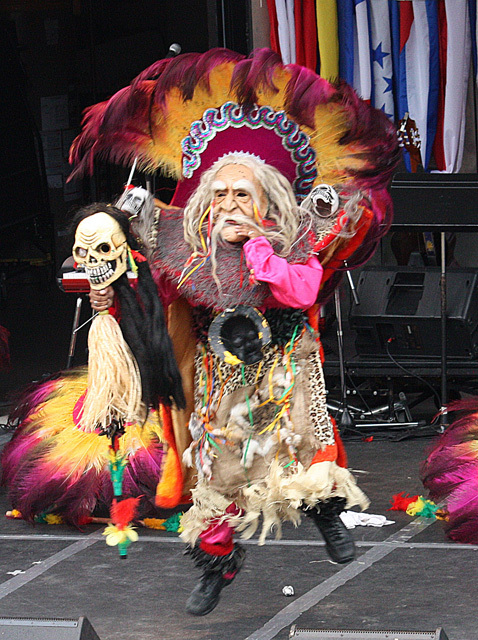 Then there was the Mexican Day of the Dead celebrations where the dancer’s faces were painted to look like skulls. Mexicans at the festival told me about the most authentic Mexican restaurants in Toronto. Every festival I attended had national dishes to sample. I’ve visited over 50 countries and loved the food in all but two. In Toronto, I discovered churros and smelly tow foo. At the festivals, I’m in culinary heaven and I don’t have to tip. By the time my two assignments were finished, I was hooked on festivals and exotic buildings. I wanted to see more. Compared to paying for a flight on an airplane, the cost of seeing the world was and is minimal as long as I stick with what’s free or almost free and don’t eat too much. I can get to most festivals by public transportation. There were problems. There wasn’t one source of information for these events. I started collecting dates and found a hundred in one calendar year, I keep finding more. On a couple summer weekends, I tried to see eight festivals. I can’t afford to go to that many if they charged a fee. I figured many people couldn’t either. As I visited the festivals, I was coming to the conclusion that Creole and Indian festivals primarily attracted only Creoles and Indians. I was frequently the only non-ethnic, well non-that ethnic person at some of the festivals. I didn’t want Toronto to be a city of 140 solitudes. I wanted people from other groups to experience the whole world, not just their own portion of it. I wanted the visit to be affordable for them and me, so I designed such a web-site: TorontoMulticulturalCalendar.com. What a wonderful job you have done here. Thank you for sharing the information with the world!